Baseball Superstars 2012 is the latest in a series of free to play sports titles, developed for the iPhone and iPod Touch by Gamevil Inc. While the Baseball Superstars series celebrates over 30 million downloads the 2012 edition of Baseball Superstars aims to add to that number. For this review we test the application on an iPhone 4S and soon found out that it has 2 options for play. The first puts you in the hot seat by having you take on the role of a baseball team manager who is attempting to take their team all the way to the top of the league. The second play option is based around you assuming the role of a rookie player who is trying to make a name for themselves within the sport. Both options are entirely free to play, so don’t expect to be surprised by that dreaded issue that often comes up in iOS gaming, that of having to pay for necessary in-app purchases. If you have played a Baseball Superstars title before you may be slightly disappointed to find out that the 2012 version is really only a slight upgrade of the previous title. The changes that this latest version contains include sharper graphics and a few new gesture based controls for both hitting and pitching. However, if unlike me, you have never played a Baseball Superstars title before, you will find a wealth of baseball related fun. 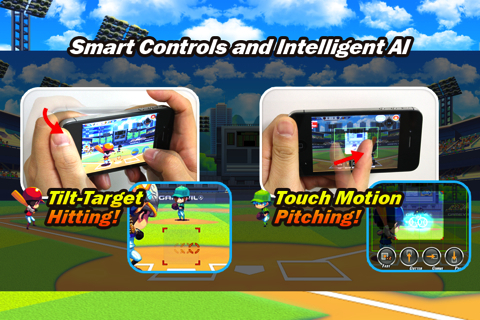 Baseball Superstars 2012 is a universal iOS app for both iPad and iPhone, and is a slick looking game. With clean, colorful graphics and a chibi style to its characters, this app is definitely one of the best looking freemium titles the platform has to offer. As for audio, Baseball Superstars 2012 is a mixed bag, with some good, and some grating backing tracks. The real meat of this iPhone app lies within its Season Long Play mode. This mode challenges the player to train, practice and socialize with NPC’s in order to earn points towards their offense and defense during matches. You will start off with just enough points for you to do well at the start, but the difficulty soon ramps up and you will find yourself really needing to concentrate in some of the matches. I did find some issues with this mode however, especially when it came to the AI controlled aspects of each match. The player only controls how every other inning plays out and unfortunately the computer controls the rest. This can be frustrating as it would be much fairer if you could control every aspect of the match. 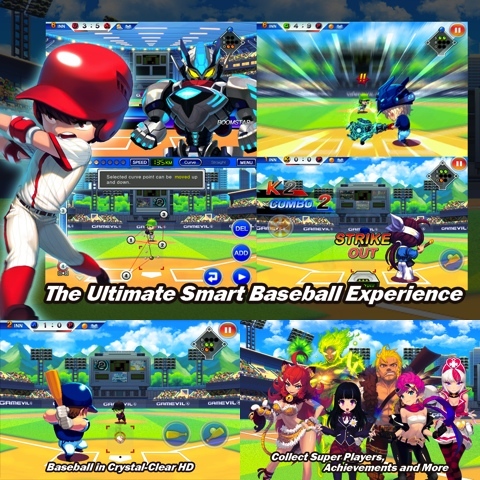 Either way Baseball Superstars 2012 is a great value and it could be said that the app is one of the best free baseball titles available for the iPhone or iPod Touch. which we highly recommend. AppSafari review of Baseball Superstars 2012 was written by Darius Reimm on March 4th, 2012 and categorized under App Store, Free, Games, iPad apps, Sports, Universal. Page viewed 4785 times, 1 so far today. Need help on using these apps? Please read the Help Page.